Welcome to another installment of LiveAnalysis! Today we have the thirteenth meeting between World No. 1 Rafael Nadal and World No. 8 Stanislas Wawrinka. The head-to-head stands 12-0 in favor of Rafael Nadal, who’s won all 26 sets of tennis he’s ever played against Stan. First Set – Stanislas Wawrinka will serve first. 0*-0: The first point of the match is a forced FH error by Nadal – Stan pushed him wide with a big CC BH. After that, we get a few tentative rallies in which Stan is the one trying to get the first strike in. Nadal has looked a little slow to react to Stan’s aggressive shots (mainly CC BHs so far) – probably due to the natural nerves that a Slam final generates. Stan ends up holding rather comfortably to 15. Here starts Stan Wawrinka’s toughest challenge: finding ways to return Nadal’s serve effectively. 1-0*, Wawrinka: A few serves go unreturned, and others are returned very short. Result? A supremely easy love hold by Nadal. 1*-1: Nadal leaves four returns way short, and Stan does not many any mistakes putting them away. He holds to 15 after dropping a point via a CC BH UFE. Rafael has a habit of starting his return games rather slowly (except on clay), but he’s very likely to make small adjustments in court position, anticipation and timing as the match wears on. Something to monitor. Other than that, we’ve had very, very few rallies. And the ones we’ve had have been rather short. 2-1*, Wawrinka: A very sloppy service game sees Nadal go down 15-40 in no time. First he chose a terrible dropper that Stan punished, then he DFed, and finally, hit a weak drop volley. And Stan breaks on his 1st chance – he resists a Nadal CC FH, and gets a look at a huge CC FH of his own. Nadal can’t handle it, and Stan is up a break. 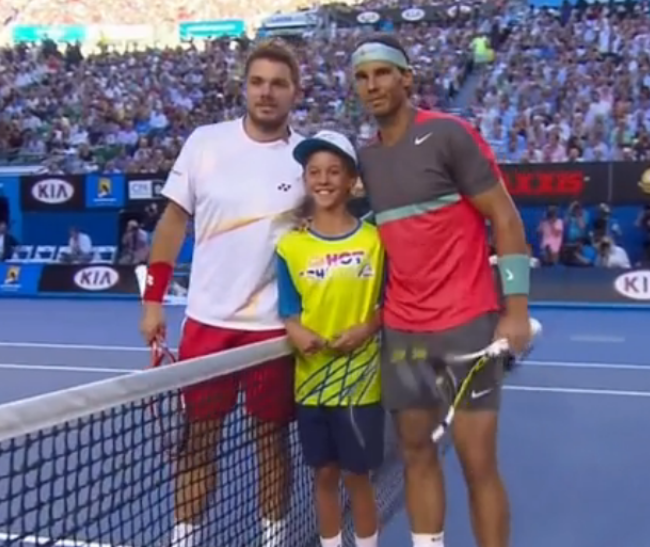 Great point by Stan at the end…but that was quite a donation by the 13-time Slam champ. 3*-1, Wawrinka: Wawrinka fires two Aces on his way to a 40-15 lead, and clinches the hold with a great S&V play set up with a great slider out wide. The shocker so far is that the player who looks more composed and determined out there is Stanislas Wawrinka, a Slam final debutant. Nadal a little bit frozen, and unable to get many (if any) quality returns in play. 4-1*, Wawrinka: Nadal keeps struggling with depth, and Stan is finding it easy to escape the famous “AD court jail” Nadal loves to use to manhandle his opponents. A great approach + volley combo makes it 30-40 – chance for a Double Break for Stan. The BP is saved with a SW out wide. Moments later, Nadal shanks a FH, but it somehow goes over the net and lands in Stan’s court – but the Swiss overhits a FH DTL off of it. 4*-2, Wawrinka: Nadal keeps getting very short returns in, and they keep getting summarily punished by Stan. And then when Rafael finally gets a deep 2nd serve in play, Stan produces a wonderful FH DTL to survive a Nadal FH DTL, and moments later fires a FH winner off of Nadal’s stunned reply. He’s on fire. Nadal claws his way to 40-30, but Stan fires a SW out wide and holds. What is really surprising about this match is how Wawrinka has handled the very few “good” Nadal shots (the ones with depth and pace), and managed to turn the tables on the Spaniard in ways that he’s rarely (if ever) done before. However, the challenge is being able to do that more and more frequently, since it’s quite likely that Nadal will loosen up at some point of this final. 5-2*, Wawrinka: Extremely easy hold for Nadal – plenty of unreturned serves tell the tale of a hold to 15, marred only by a DF. Now, crunch time for Stan, who gets to maybe do something he’s never done before: take a set off of Rafael Nadal. 5*-3, Wawrinka: Nervy start for Stan – hits a great CC FH, but shanks an easier FH moments later. 0-15. Nadal then fires a 2nd serve FH DTL return winner. 0-30. Simply insane defense by Nadal is augmented by a subtle little letcord that lets him turn the tables on Stan and push him far behind the baseline with some big FHs. 0-40, triple Break Point. 2nd serve…it’s a very easy serve to Nadal’s BH, but the Spaniard nets it. Costly UFE. 15-40. 2nd serve again…and another BH 2nd serve return is botched – this time long. At least that was a decent wide serve. 30-40. 2nd serve yet again…Now a horrific FH 2nd serve return is sent miles long. Unbelievable mistakes from Nadal – that was another costly UFE. Deuce #1. SW out wide, and it’s Set Point #1 for Wawrinka. Which is converted with an Ace out wide – he’s finally taken a set from Nadal! Nadal will deeply regret missing those second serve returns, particularly the one in the first Break Point and the one in the third Break Point. Uncharacteristically sloppy from the Spaniard. First Set to Stanislas Wawrinka, 6-3. Second Set – Rafael Nadal will serve first. 0*-0: Stan gets a look at plenty of big FHs, and fires them all accurately. To the tune of a 0-40 lead. And a stunning CC BH return winner nets Stan the break! Those were all winners. Not much you can do…except try to get better depth so that teeing off isn’t that simple. Still, remarkable power tennis from Stan. 0-1*, Wawrinka: Not a whole lot of drama for Stan, as he holds to 30 after another great S&V play. Why was it great? Because the serve was so good that Stan was left with the simplest of volleys. Tactically speaking, Nadal needs to make Stan’s BH beat him. The Swiss is doing all sorts of damage with his big FH. Also, Nadal needs to get Stan on the run as much as he can. Yes, Wawrinka has covered the court extremely well (surprisingly, given his career), but Nadal just can’t afford to let Stan step inside the baseline to blast away. As for Stan…keep doing everything you’re doing! That, of course, has been: taking advantage of every short ball and punishing it with effective CC shots (off either the FH or the BH), keep Nadal guessing on return, and take advantage of every single short return. 0*-2, Wawrinka: At 40-30, Nadal clutches his back, bends over, and winces in pain. He gets pushed to Deuce, but ends up holding anyway. If Nadal is injured…overcoming a red-lining Wawrinka becomes more or less mission impossible. Also, this is a new injury – I don’t have any memory of him having any back issues. As I type this, Nadal leaves the court to receive a medical time out. When he comes back, he is greeted with boos from the crowd. A new low for them. Stan spent most of the time out angrily arguing with Carlos Ramos about his alleged right to know what the problem with Nadal was. 1-2*, Wawrinka: Stan holds to love, Nadal barely moves. 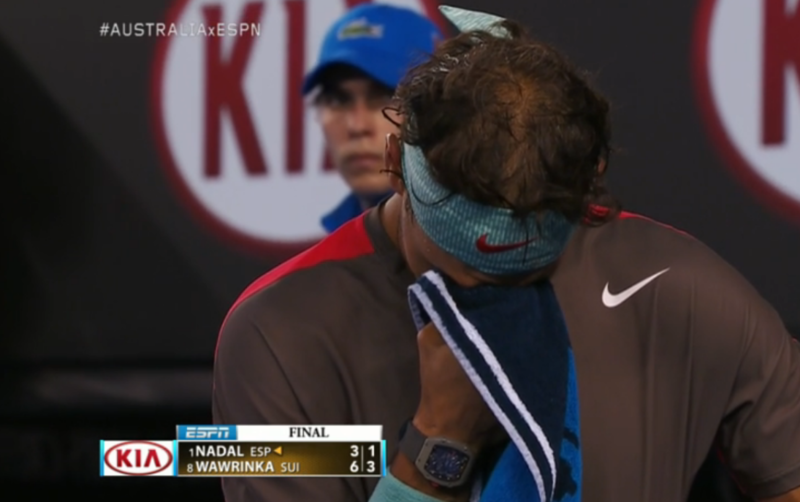 After the hold, Nadal heads to his towel and clutches it over his eyes for a while. The man is devastated. 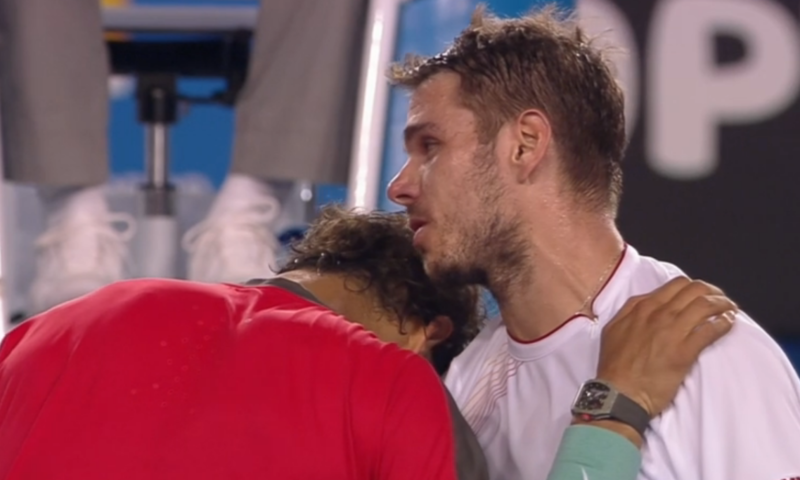 1*-3, Wawrinka: Nadal can barely serve anymore – he’s just slicing every single one, and trying hard to contain the tears. Moments later, he falls behind 15-40, hits a bad dropper, Stan chases it down, and Rafael doesn’t even attempt to chase his shot. Wawrinka now up 2 breaks. This is just awful. You never want an injury to ruin a Slam final, and this one was still in its infancy. 1-4*, Wawrinka: Stan plays a loose, loose game, and is pushed to Deuce. However, he ends up holding after firing an Ace and a short putaway. Nadal’s only hope is that the painkillers he inevitably took start taking effect, numbing him out. The challenge is to extend his match long enough that when he’s finally able to compete as hard as he wants, the scoreline isn’t out of reach. 1*-5, Wawrinka: Some strange, slow points are played, Nadal misses a few FHs, and he’s down 15-40, Double Set Point. Saves one with the slowest S&V sequence in history. 30-40. Nadal comes to net again, but Stan’s return goes way long, so Deuce. Somehow, Nadal ends up holding. 2-5*, Wawrinka: Stan holds to 15, so he takes the second set. This is barely a tennis match. Nadal can’t move and can barely serve, Stan can’t hit away from Nadal all the time. If the painkillers don’t kick in soon, this will either be over with another set like that, or via retirement. Second Set to Stanislas Wawrinka, 6-2. 0*-0: Stan goes up 15-40 in no time…and with very little effort. He’s still finding it hard to hit away from Nadal, somehow. He misses a FH. 30-40, he misses a return. Later, and again, by some miracle, Nadal ends up holding. Stan lost earlier this year at Indian Wells to a hobbled Roger Federer. His compatriot wasn’t nearly as limited as Nadal is at the moment, but the point remains. He’s not executing a simple gameplan: make the injured player move. 1-0*, Nadal: Stan hits a DF, then Nadal gets a good FH in, and it’s 0-30. Then Stan again lets Nadal hit a FH without having to move sideways, and it’s 15-40. The first BP is saved via a slider out wide Ace – Nadal does not cover that serve anymore. 30-40. But then Stan sends a very meek FH (off a short Nadal return) into the net. Nadal, somehow breaks. 2*-0, Nadal: At 30-30, Stan sends a FH well wide. UFE. 40-30. Then he botches a very slow return. Quite a collapse here. 3-0*, Nadal: Stan finally breathes again, and holds to…30. Because he did manage to botch a couple of shots anyway. 3*-1, Nadal: Stan keeps hitting at Nadal, Nadal flattens out shots (as he should, given that he can’t move), hits winners, and he holds. 4-1*, Nadal: Stan goes down 15-30 after giving Nadal looks at comfortable shots. However, Stan gets some decent serves in, and for once, hits away from Nadal, and holds. 4*-2, Nadal: Nadal, once again, is up 40-30. Stan keeps insisting on rallying straight to him, with the exception of a point in which he hit a sick CC BH winner from outside the doubles alley. Moments later, Stan botches a return, Nadal holds. 5-2*, Nadal: Stan holds at love by hitting good serves away from Nadal, and putting away short returns away from Nadal. 5*-3, Nadal: Stan finally fires a FH into the open court, wins the point. 0-15. He then can’t handle a big Nadal FH (hit while standing comfortably on the baseline), so 15-15. Nadal then botches a short FH off a short return, so 15-30. That might prove costly, as he then sends a BH DTL wide. 15-40. Botched return, 30-40. Rinse, and repeat. Deuce. Stan then sends a return straight at Nadal, and can’t get a BH in play afterwards. Set Point #1 for Nadal. Stan, again hits a good FH DTL, and that’s enough to set up an easy CC FH winner. Deuce #2. Wild I-O BH by Stan, so Set Point #2 for Nadal. And a botched return, appropriately, seals the set for Nadal. That was…special. And not in a good way, Stanislas. Third Set (somehow) to Rafael Nadal, 6-3. Fourth Set – Stanislas Wawrinka will serve first. 0*-0: Stan plays a coherent, focused game, and holds at love. 1-0*, Wawrinka: Nadal seems to be moving a little better, but his serves are all still weak 2nd serves. Stan goes up 15-40 after moving Nadal side to side (FINALLY). However, he botches a serve return once again. 30-40. Rince and repeat, so Deuce. Wild return error, so Nadal has a chance to hold. Then, Stan finally puts a return back in play, but it’s super short. Nadal jogs to it and puts it away. Stanislas Wawrinka’s returning on Break Points after the injury happened has been abysmal. Simply abysmal. He’s dealing with weak 2nd serves, and yet they’re all ending in the net. 1*-1: Another easy game from Stan. Maybe he is now ready to finally finish this. 2-1*, Wawrinka: More bad returning by Stan and more sloppiness allows Nadal to go up 40-0. But hold the presses – Stan gets two straight returns with depth, and forces errors both times. 40-30. However, a merely OK slider out wide by Nadal goes unreturned, so Rafael has held yet again. 2*-2: Stan loses the 1st point after a good return by Nadal, but then wins 4 straight points on the back off very good serves (placed mostly away from Nadal). He holds. 3-2*, Wawrinka: Stan botches a short ball after a surprising get from Nadal. It would’ve meant 0-30. BH UFE by Nadal, and it’s 15-30. FH DTL UFE by Nadal, and once again, it’s 15-40. And FINALLY, the break comes – Stan fires a FH DTL winner after yanking Nadal the other way with a good return first. 4*-2, Wawrinka: Somehow, it’s 0-40. Horrorshow by Stanislas Wawrinka. To say this is hard to watch is an enormous understatement. And he completes the disaster by sending a short FH DTL well wide. Nadal, somehow, is back on serve. 4-3*, Wawrinka: Nadal comes to net, can’t get Stan’s good pass over it. 15-40. Once again, Stan fires a FH DTL and breaks again. Now he gets to serve for it. How can this possibly go wrong? 5*-3, Wawrinka: Stan goes up 30-0 after a good S&V attempt. A good slider out wide triggers a return error, and it’s Triple Championship Point. Finally, Stan puts away a short FH, and he’s the 2014 Australian Open Champion. Game, Set, and Match to Stanislas Wawrinka, 6-3, 6-2, 3-6, 6-3. How do you see Stan performing in the other Slams this year, Juan? I think he could do very well at the US Open. He reached semis last year, so perhaps he could repeat that or perhaps even reach the final. And he’s always been very comfortable on clay and he reached the QF last year losing to Rafa I think, so a semifinal there is also up for the taking, I guess. Do you see him ending the year in the Top 4? What do you mean by the Delpo curse? its interesting because I also have my version of the Delpo curse-that the winner of the grand slam would not come out of his half. With him out early this time I thought nadal had a much better chance to win. Delpo has this way of sucking out the win from his competitors so that they are at a significant disadvantage in the susequent matches. Fed at the Olympics,Djokovic at Wimbledon. For that matter Delpo was in Djokovic’s half of the draw in the US Open although they never played. The Delpo curse is very well-known. And yes, my version is same as yours through one player from Delpo’s can still win the whole thing–Delpo himself. And the curse works with/without Delpo alive in the draw, he only need to ‘be’ in the draw. Had a feeling as Stan continued to move through the field that he would have a real shot to beat Nadal under any circumstances and that turned out to be the case. Even before Nadal’s back began to act up, Stan was the aggressor and the better player. Already, 2014 was shaping up to be interesting on the men’s side and having Stan playing at such a high level only adds another layer of intrigue.